If you have your eyes set on running a company someday, you may wonder what skills you need to cultivate now, as well as the best age to make a run for the position. 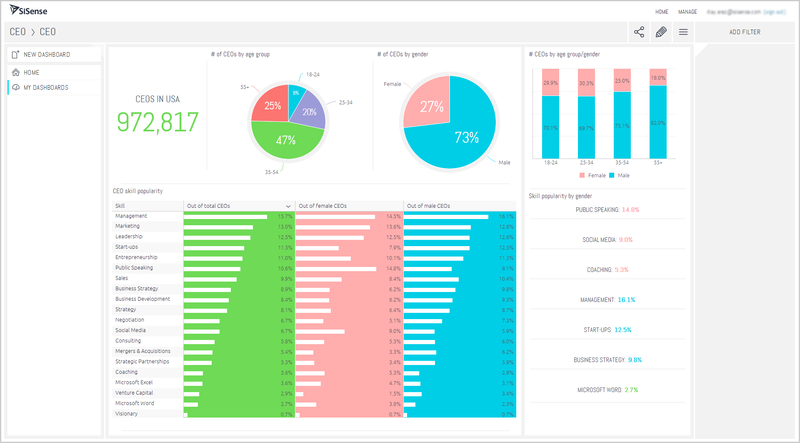 Well, we took information from LinkedIn profiles of close to 1 million CEOs in the United States, and built some pretty eye-opening data visualizations using Sisense BI software. Here’s your chance to learn what it takes to get that corner office. 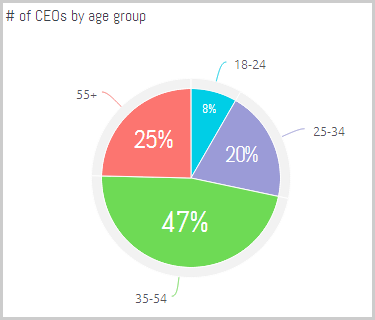 While there is no foolproof map for climbing up the corporate ladder, many people wonder what’s the most suitable age to become CEO, with an ongoing debate about if younger CEOs possess the “know-how” for true leadership, and on the flip-side, if older CEOs are up to the job. The Wall Street Journal broke down the pros and cons of both, concluding that younger CEOs tend to be more energetic, creative, and are known as risk-takers, while older CEOs bring a wider range of experience in problem-solving and are known to be more skilled at managing both people and processes. It’s hard to win a philosophical argument, which is why looking at data is the best way to get an objective answer: Our data visualizations shows a larger trend towards older CEOs, with almost half the number of CEOs reported to be in the age group of 35-54, and a large 25% in the age group of 55 years and older. Though a solid 20% are considerably young, in the lowest age group of 25-35 years old, the magical moment for entering new C-level heights may be 35 and onward. Good news for the ladies of this generation. The data reveals that though the gender of CEOs is still far from being balanced, with only 30% of women versus 70% of men, younger women (30%) are almost twice as likely to become CEOs than women of the older generation (18%). That’s one small step for womankind. One possible explanation for the small drop in the percentage of women as CEOs in the youngest age group could be because males are more likely to join the start-up scene, as 11.3% list ‘start-ups’ in their skill set, while only 7.9% of women do. Startups are known for having younger and more innovative leaders than any other industry. Today, there are now 20 female CEOs running America’s largest companies–which is actually a record number–and more than half landed the top job between the years 2011 and 2012, like Ginni Rometty of IBM, Marissa Mayer of Yahoo, and Rosalind Brewer, who is the first woman and African-American to head a large subsidiary company of Walmart. The image CEOs project is incredibly important to the perceived value they give to a company, which explains why ‘management’, ‘leadership, and ‘entrepreneurship’ are all among top skills CEOs list on their LinkedIn. Though, it is curious that ‘management’ is less popular among women, even though ‘leadership’, a softer synonym for management, is listed in exactly equal percentages. This may be because women fear being associated with the notorious B-word , giving more fire to the recent campaigns for banning the word bossy when referring to females–especially in the leadership arena. The data also begs the question if some skills are more masculine or feminine than others, or are perceived to work more in the favor of one gender over the other. For example, the skills ‘negotiation’ and ‘business strategy’ appear more for males, while ‘social media’, ‘coaching’ and ‘public speaking’ are listed more often by women. Food for thought: do women have more pressure to project a friendly and social public image? When Michael Dell said, “you don’t need to be a genius or a visionary, or even a college graduate for that matter, to be successful”, he was definitely onto something. Only 0.7% of the CEO’s list ‘visionary’ as a skill, debunking the common idea that having a vision is an absolute must for successful leaders. Interestingly enough, one of the most common, concrete and nuanced skills CEOs lists is ‘marketing’, which appears as the #2 skill for both men and women. Though this isn’t completely left-field, marketing is a much more specific skill than most of the other top skills listed like: leadership, management, and entrepreneurship. More and more CEOs are emerging from marketing departments, especially when compared to sales departments which only appears as #7 on the list. Marketing is revealed as a lucrative career skill that could possibly make or break your dream to become CEO. This is possibly due to the strategic thinking skills built into the very fabric of marketing, as well as the social aspect that has become a more valued expertise in today’s business world. Microsoft Word Supports Career Advancement? Rules like “Know everybody by their first name” and “No goals, no glory” may seem obvious, but what does Microsoft Word and Excel have to do with career advancement? Well, a whopping 2.7% of CEOs list Microsoft Word as a skill. So, hey– if you know Microsoft Word, you’re already 5% on your way to having the top skills of CEOs!